Well, the thumb is getting better... but not before it got me an a little more trouble this weekend. I've said before that I love looking at other people's amigurumi designs almost as much as I love designing my own. So, since I was laying off the thumb a little bit, I decided to do a little surfing on Etsy. 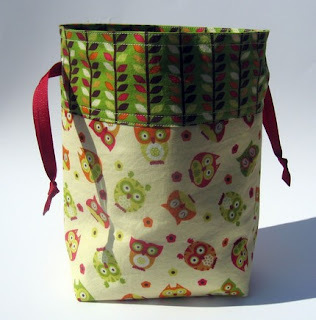 Seems that my latest obsession is owls, so I entered the search terms "owl crochet" and stumbled across the PERFECT little project bag! 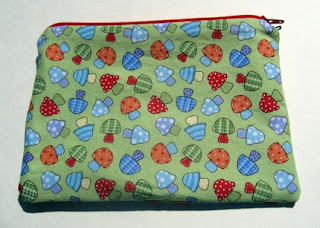 The owl one shown is m-i-n-e MINE, but Dancing Sheep has a lot of other cool colors and designs available in her shop. Her fabric selections are just so much fun! 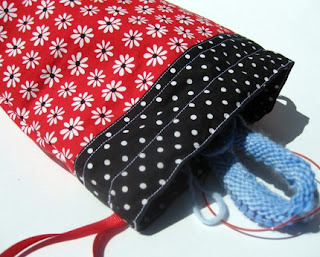 The nice thing about Dancing Sheep's bags is that you don't have to be a knitter or crocheter to enjoy them. 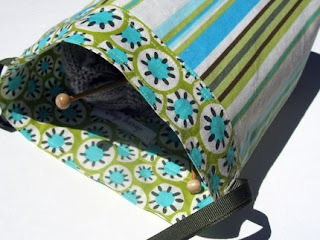 The little mushroom zippy bag would make a cute tote for sewing notions, makeup, pencils, or other little things, and I can think of about a thousand other uses for the "project bags."